Multi-door lockers are best implemented in facilities and businesses where individuals need a space to safely store their personal belongings. Let’s take a look at some of the real-world applications for these multi-door lockers! Construction and development sites often have a mountain of equipment that needs to be put away at the end of a work day. Apart from larger mechanical equipment that’s difficult for thieves to target, smaller more portable items like safety gear, tool belts, and headwear can easily be snatched if they’re not locked up. The problem, however, is that employees sometimes do not have the means to transport them to and from the site each day. For that reason, among others, multi-door lockers or uniform lockers may be solutions. Each employee can be assigned their own personal locker to keeps their items in while off the clock. As an added bonus, many multi-door lockers have an anti-bacterial paint to prevent the spread of microbes. Probe—an excellent locker supplier—produces high-quality products, made to withstand repeated use. One example is this Perforated 4 Door Steel Locker . Economically priced, this locker provides proper ventilation and visibility of the contents which is great for things like work boots which tend to amass unpleasant odours. Moreover, it has “germ guard” anti-bacterial paint which comes in 6 colours (light blue, java, green, buttercup yellow, regal blue, and light grey). Another great use for multi-door lockers is to store cash, electronics, and personal jewellery. Locations like gyms, spas, and swimming pools, which frequently cater to incoming and outgoing traffic, would greatly benefit from these storage instruments. Not only does it provide patrons with a place to keep their personal belongings but it minimises the risk of theft and other related issues. Already a staple in schools, multi-door lockers offer administrators and staff visibility of contraband items. With optional perforated exteriors, teachers and administrators can easily scan the lockers to ensure that no weapons, drugs, or paraphernalia have been brought onto the premises. Retail outlets and stores can also make use of these multi-door lockers to hold excess inventory. Constructed with steel doors and secure compartments, it’s an investment well worth the cost. 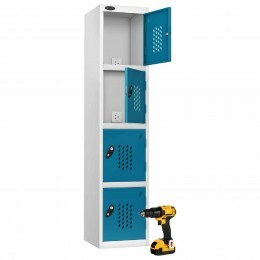 Multi-door lockers are suitable for a wide range of uses including maintaining sight of contraband, providing additional storage, protection from theft as well as organisation. Probe is a highly recommended brand of multi-door lockers.